Smokers are nearly twice as likely to develop an abdominal aortic aneurysm as the general population. Quitting smoking can substantially reduce the risk of developing this life-threatening condition. Health policy experts and doctors should be more aware of the high risk for abdominal aortic aneurysm among women who smoke and should consider screening for the condition. Dallas : People who smoke may be nearly twice as likely to develop an abdominal aortic aneurysm than the general population, but they can lower their risk of the potentially life-threating condition by quitting, according to new research in Arteriosclerosis, Thrombosis and Vascular Biology, an American Heart Association journal. 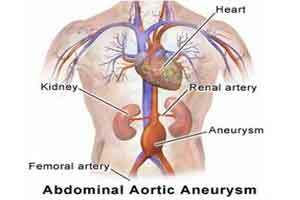 An abdominal aortic aneurysm is a bulge in the large artery that supplies blood to the belly, pelvis and legs. This bulging occurs without symptoms, unless the artery ruptures. If that happens, severe internal bleeding creates an extremely urgent medical situation. The study looked at 15,792 people over the age of 45 enrolled in the national Atherosclerosis Risk in Communities Study. After 22 years of follow-up, researchers identified 590 cases of a ruptured, surgically repaired or clinically diagnosed asymptomatic abdominal aortic aneurysm and 75 cases of asymptomatic aneurysms that were detected by an ultrasound screening. 1 in 12 among current female smokers. Researchers also found those who had quit smoking for 3-8 years (recent quitters) still had an approximately 2.6 to 3.5 fold increased risk for both clinical and asymptomatic abdominal aortic aneurysm in the next 15 years compared to never smokers. Their lifetime risk was 6.6 percent higher than long-term quitters. For women, authors note the steep increase in risk is particularly concerning given the United States Preventive Services Task Force recommends that current or former male smokers undergo an ultrasound screening for an abdominal aortic aneurysm once between the ages of 65 and 75 but makes no such recommendation for women. The study also found that being older, white, or having high levels of bad cholesterol also increased the risk of abdominal aortic aneurysm. Authors wrote that study limitations, including some study participants dropping out of the follow-up and risk calculations were only performed up to the age of 85, may have led to lower estimates of life-time risk of abdominal aortic aneurysms than actually exist.